I realise I've already covered the Marx Brothers once this month but I really couldn't resist Groucho's wild dancing in Animal Crackers as Captain Jeffrey T. Spaulding. 'Hooray for Captain Spaulding' would later be reused as the theme for his long-running quiz show You Bet Your Life (1947-61). The character's name was rumoured to have come from Paramount's in-house coke dealer and would later be borrowed for a murderous redneck clown in Rob Zombie's nasty horror flick House Of 1,000 Corpses (2003), along with characters called Driftwood and Firefly after other famous Groucho aliases. One wonders what on earth the old scoundrel would have made of such a left-field tribute. Animal Crackers was only the Brothers' second feature and it captures some of the frothing energy of their legendary stage shows but does feel rather flat and constricted, more like an unimaginatively filmed play than a movie and Zeppo in particular is left with very little to do. The farcical plot, about a misplaced painting, is neither here nor there. However, Margaret Dumont, a survivor of the original Broadway version, is especially lovely as Mrs Rittenhouse, often struggling to suppress a giggle at Groucho's rapid-fire zingers and spoof soliloquising (a lampoon of Eugene O'Neill's lengthy, experimental play Strange Interlude, 1928). 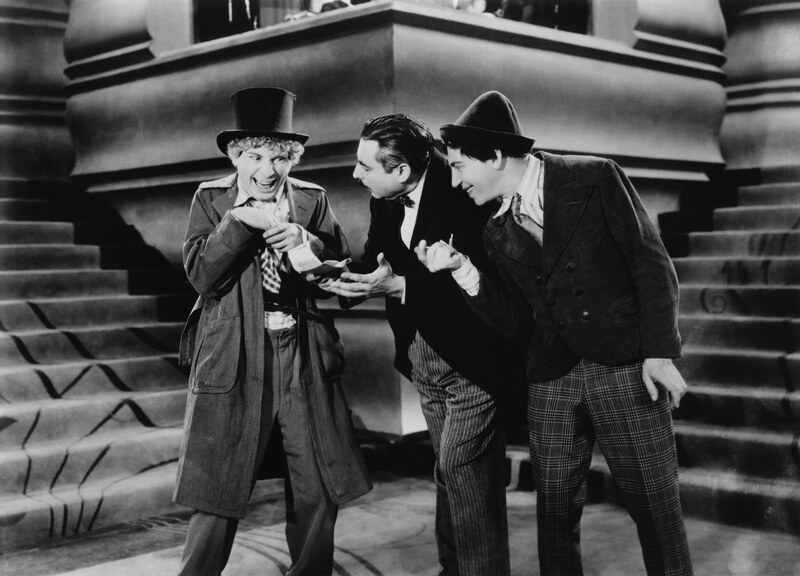 Harpo is also on splendid form as The Professor: sporting nothing but underwear beneath his hat and cape, he has fun shooting at statues, sabotaging bridge games, trying on ladies' shoes, producing insane objects from every pocket and chasing Long Island high society blondes around the grounds. Naming Robert Grieg's chubby butler "Hives" was an inspired move, although it was a favourite gag of Laurel and Hardy and would be used by them again that same year in the classic short, Another Fine Mess (a remake of an earlier silent outing from 1927, incidentally, that happened to be called Duck Soup and whose supervising director was one Leo McCarey). There's also a nice self-referential joke when the pompous Roscoe W. Chandler (Louis Sorin) is exposed by Chico as a Czech fishmonger called Abie Kabbible and retorts, "Say, how did you get to be Italian?" Veteran director Victor Heerman, a former editor at Keystone, was assigned to the project because of his reputation as a merciless disciplinarian but even he failed to bring order to the Marx madhouse and was allegedly forced to make use of a prop jail to imprison the wayward brothers in during the lulls between shooting. Without this slight infringement of their human rights, Animal Crackers might never have been completed, so difficult was it to keep all four siblings in one place and on time. J.B. Priestley saw the finished film upon its release and described himself, "lost in wonder and joy", and declared Groucho to be "urban America, the office executive, the speculator, the publicity agent, the salesman, raised to a height at which the folly of such men blazes like a beacon."